From Inside Out there’s a sequel of sorts where Riley is a teenager and we see “Riley’s First Date” from the inside-out emotional control rooms of her trying-to-be-cool mother, her scowling and disapproving father, and even the young man who dares to date their daughter. A twist ending provides a nice payoff. From the Cars franchise we get two offerings. “The Radiator Springs 5001/2” concerns a “gang” of cars that interrupts the Founder’s Day celebration and challenges Lightning McQueen to a race that, thanks to Mater, goes WAY off course. And “Miss Fritter’s Racing School,” which was released with the Cars 3 DVDs and Blu-rays, takes that popular new character and the demolition derby into areas where the film didn’t reach. From Finding Dory there’s “Marine Life Interviews,” a short compilation of in-character, in-sea interviews with friends of Dory’s that concludes with Dory herself. It’s probably the slightest of the movie-related short films but wasn’t intended to be anything more than a fun take-off on bonus features that show people talking about another actor or character. From Monsters University we get “Party Central,” a “heist” short film that shows how the losers from Mike and Sully’s fraternity manage to shift the biggest party of the year to their own frat house. From Brave we get a more darkly (and two-dimensionally) animated “Legend of Mor’du,” that gives a backstory and a bit of texture to the whole early medieval Scottish princess thing—to give viewers some notion of the myths that helped shape Merida’s mindset. Of the more personal visions, nature lovers will appreciate “Piper,” by Ross Haldane Stevenson. 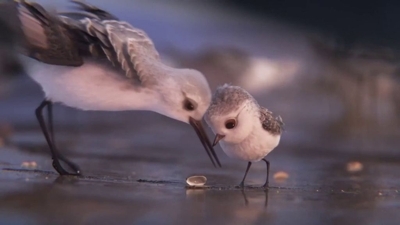 It’s a cuddly-cute story of a mother sandpiper who tries to teach her reluctant and skittish little puffball of a baby bird how to feed off tiny clams after the surf pulls back . . . but before it can come back with great force. This one was one of our family’s favorites, and it turns out that the Academy thought so too; “Piper” won the Oscar for Best Animated Short Feature. Close behind is “Bao,” written and directed by Domee Shi as a kind of tribute to her protective mother who had told her she wished she could just “swallow her” to keep her safe from the world. In this short, a Chinese mother makes dumplings and is shocked to discover that one dumpling is alive. She nurtures that dumpling as it goes through the typical childhood life cycle and has to deal with her feelings by film’s end. It’s another very strong entry. But so too is “Sanjay’s Super Team,” directed by Sanjay Patel, who said he also had a story to tell about his relationship with a parent. This time it’s the father, an Indian traditionalist who tries to get his young son to pray at the altar to the Indian gods and guardians, though his son seems more interested in his superhero action figures. It takes a vision or a burst of imagination for all that to change. Kids who’ve had to deal with playground bullies will appreciate “Lou,” a story about a kid who just doesn’t know how to play with others. His transformative revelation comes when he runs into a Lost and Found crate that has a live “creature” in it that looks a bit like a sock puppet version of a Sesame Street character. That character does for him what the ghosts do for Scrooge . . . but in a sweeter and more comic way, of course. More lyrical are “The Blue Umbrella” and “Lava.” The first feels like a children’s book come to life, about the journey one umbrella makes on a rainy, windy day; the second features an original ukulele song from James Ford Murphy that tells the story of two volcanoes that finally come together in the Pacific. The run times range from four and a half minutes to just under eight minutes. 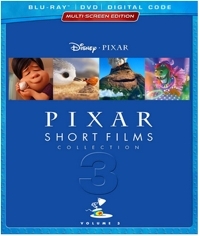 Disney, of course, got their start in short subjects, so it’s admirable that the studio keeps celebrating this art form, and Pixar Short Films Collection: Volume 3 is worth celebrating. There’s nothing here that isn’t suitable for the entire family. Curiously, though, I was unable to find a way to “Play All,” which is surprising since this comes from the studio that invented FastPlay just so kids could pop in a disc and watch it loop away. I guess you can’t have everything.